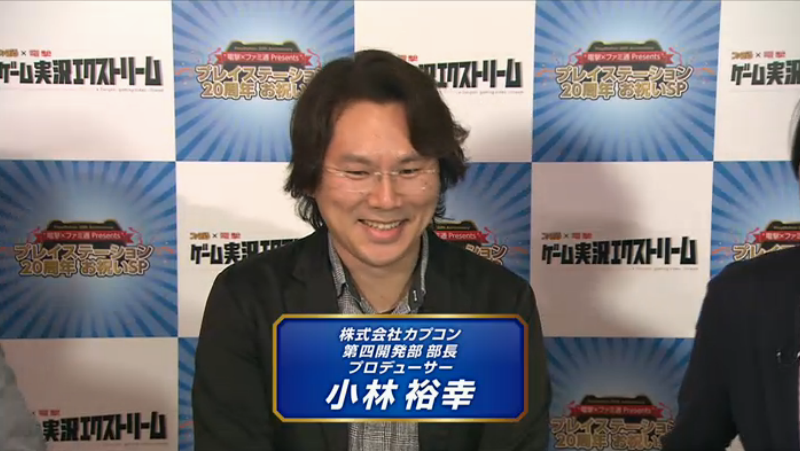 Sengoku Basara producer Kobayashi 'KobaP' Hiroyuki got people excited earlier today when he appeared as one of a number of industry guests on a joint broadcast by Dengeki and Famitsu to celebrate the 20th anniversary of the original PlayStation. If you have a Nico Nico account you can watch the time-shifted version for a limited time here, or alternatively it's on YouTube here. KobaP's segment can be found at the 33:10 mark on the Nico Nico version and at 1:03:30 on YouTube. Most of the discussion was centred around KobaP reminiscing about creating various games for the PlayStation, but at one point the hosts tried to coax some new information out of him. In response, he talked about how the current Butai Sengoku Basara 4 stage play was in Nagoya approaching the end of its run, then brought up next year's Basara Matsuri, inviting the hosts along and promising that it was going to be really fun. He went on to suggest that since they were holding that big event in February 2015, wouldn't you expect something there? Before anyone could press him further, he went back to describing the cool things that happen at Basara Matsuri events and moved the conversation along. A little later on, host Dogma Kazami was asking some general questions about KobaP's planned lineup and received the answer that something would be announced the week after next. He refused to say more on the subject other than that things will start moving along soon, and that there are a few things for next year (this line trailed off). It's worth mentioning that the upcoming announcement could easily relate to Biohazard, Dragon's Dogma or one of the other series he works on (heck, it could even be more Gaist Crusher given how much time KobaP seems to spend promoting that series). We can probably safely assume that it's for a PlayStation platform, at least, otherwise it would be rather cruel to mention it at a PlayStation-themed event! OMG!!! Thats killing me right now!!! I so want to know the news!!!! lol I love basara too much! I hope we get some news next weekend... there's just one week more to wait until we find out!